It’s interesting how quickly the Department of Justice Inspector General’s report vanished from the front pages and lead segments of the establishment media when we have just begun to plumb the depths of its almost 600 pages of findings. Both documents are embedded below. And one of the most important revelations from the report is one that the establishment media has studiously ignored – and that is that President Barack Obama knew all about Hillary Clinton’s off the official government network server. From our own experience working with the White House we understand how closely the communications of the President and Vice President are monitored, so the notion that Obama heard about Clinton’s unofficial email address from the news media sounded like a lot of baloney, and now the Inspector General’s report has confirmed it. Our friend former Secret Service agent Dan Bongino explained to FOX how the President’s email works. Bongino said the emails coming into the former president’s personal cellphone had to be vetted in advance, meaning it had to go through White House security too. “That provides a perfect incentive for Barack Obama’s Department of Justice to make the Hillary Clinton email investigation go away like an Alka-Seltzer tablet in water because Barack Obama would have been a witness,” said Bongino. FBI analysts and Prosecutor 2 told us [the Office of Inspector General] that former President Barack Obama was one of the 13 individuals with whom Clinton had direct contact using her clintonemail.com account. 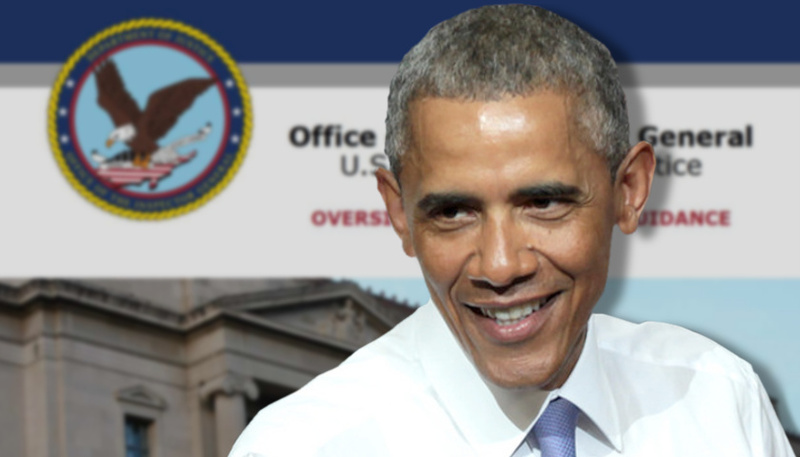 Obama, like other high-level government officials, used a pseudonym for his username on his official government email account. Now here’s the important part of this – former FBI Director James Comey know this was a problem and so did former Attorney General Loretta Lynch and so did Romeo FBI agent Peter Strzok because Hillary Clinton used the email in unsecure environments, including during trips to hostile nations. Comey said that his comment to Yates about appointing a special counsel also was motivated by concerns about the appearance of political bias in the Department. He said that these concerns were based on the overall political environment—given then President Obama’s comments about the investigation, he did not think the Department leadership could credibly complete the investigation without charges. [P]resident [Obama’]s comments obviously weighed on me as well. You’ve got the President who has already said there’s no there there…. And so all of that creates a situation where how do we get out of this without grievous damage to the institution? A June 25 draft added a sentence to a paragraph that summarized the factors that led the FBI to conclude that it was possible that hostile actors accessed former Secretary Clinton’s private server. This new sentence stated, “She also used her personal email extensively while outside the United States, including from the territory of sophisticated adversaries. That use included an email exchange with the President while Secretary Clinton was on [sic] the territory of such an adversary.” On June 30, Rybicki [Comey’s Chief of Staff] circulated another version that changed the second sentence to remove the reference to the President, replacing it with “another senior government official.” The final version of the statement omitted this reference altogether and instead read, “She also used her personal email extensively while outside the United States, including sending and receiving work related emails in the territory of sophisticated adversaries.” FBI emails indicate that the decision to remove this sentence was based on concerns about litigation risk under the Privacy Act. But here’s what’s even more interesting, a September 2, 2016 text from FBI attorney Lisa Page to her lover, FBI Romeo agent Peter Strzok, stated that “potus wants to know everything we are doing,” both Strzok and Page told the IG that the text related to the Russia probe, not the then-inactive Clinton email investigation. The Privacy Act “litigation risk” excuse is pure nonsense – it is clear to us that many of the contortions the FBI and Department of Justice went through weren’t to protect Hillary Clinton, they were to protect Obama from being exposed as a liar and an accessory in Hillary Clinton’s misdeeds.